I started with a piece of 8 1/2 x 11 sheet of cardstock, trimmed off 1/2" x 11" strip and trimmed the remaining sheet into 4 x 5 1/2 inch cards and inked the edges. I cut several pieces of leftover vellum in half - in this case, using the Cuttlebug wavy blade. I cut the vellum to fit the card and set aside. 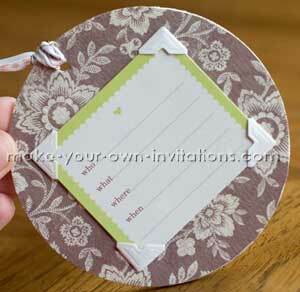 You can stitch the edges now, or wait until you have all pieces ready, ensuring everything will fit in your pocket. For the invite portion of the card, I pre-measured the maximum size tag would fit on the card, and played with wording and font size in Microsoft Word until I was happy. 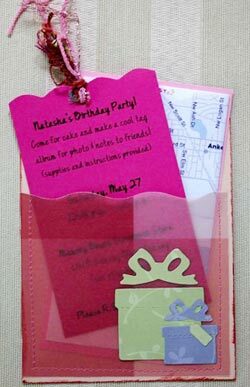 In this case I used scraps of paper, but it would be just as easy to copy the text several times onto one sheet of cardstock. After printing I trimmed the tag evenly around the text, and again used the Cuttlebug wavy blade to decorate the top. 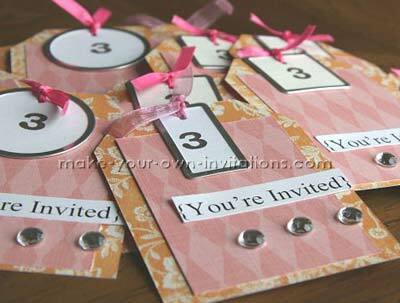 I punched a hole and added fiber, particularly because this particular birthday party included making a tag book. 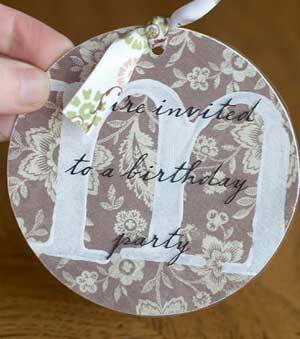 This is an excellent way to use up all those fibers or ribbons I purchased so many years ago! I printed the mapquest map on plain white paper, folded into 4ths, and cut a piece of cardstock just slightly bigger than the map. 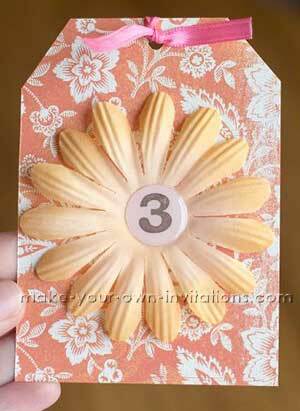 Make sure to adhere the back, unprinted side to the cardstock. Yes, you could print the map on CS, or simply include the map, but this took less time and allowed for a larger map. 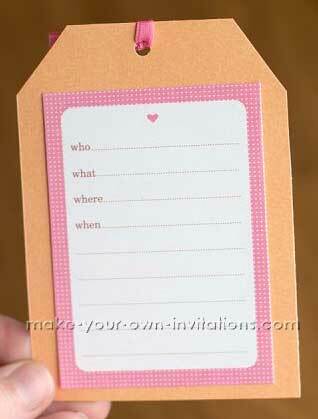 The pink cardstock made it less likely to be lost in the mail pile as well. 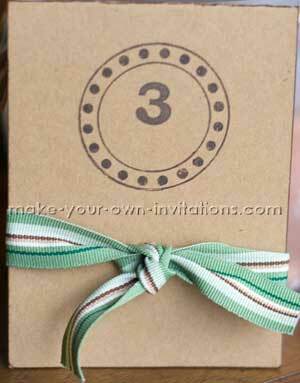 Brown invitation with a ribbon closure. The '3' is hand stamped. 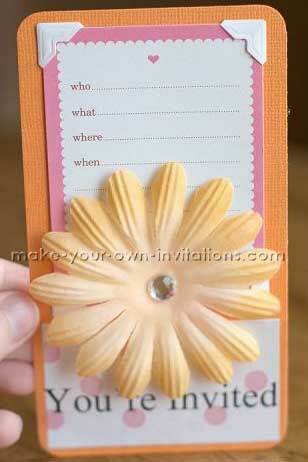 The inside with a Martha Stewart invite card. 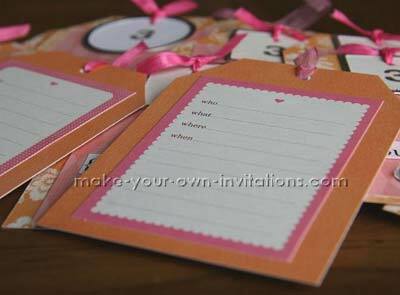 The back of the invite for the party details. 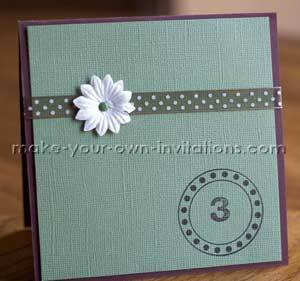 And this is the finished product - They are very different from of the sample invites that I originally offered her, but this is what she wanted.